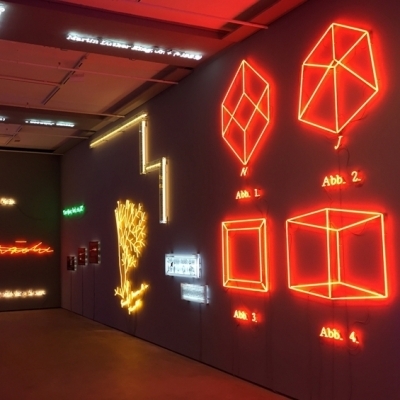 October 1 – Sean Kelly is delighted to announce ‘Agnosia, an Illuminated Ontology’, a major installation of neon works over five decades by internationally acclaimed Conceptual artist Joseph Kosuth. 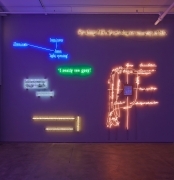 This will be Kosuth’s first exhibition at the gallery since 2011 and his first exhibition in the new space. The opening reception will take place on Friday, November 6, from 6:00 to 8:00pm, and the artist will be present. 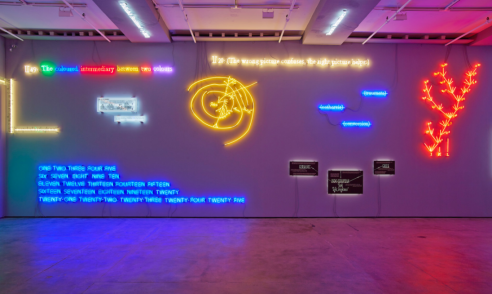 Featuring over forty works dating from 1965 to the present, the installation simultaneously chronicles Kosuth’s fifty-year investigation into the role of language and meaning in art, and his consistent use of neon. 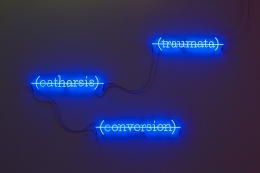 The exhibition includes historic early works, featuring one of the most important neons Kosuth ever made, ‘Five Fives (to Donald Judd)’ [blue], (1965), alongside more recent works such as his ‘Camus Illuminated’ series (2013). 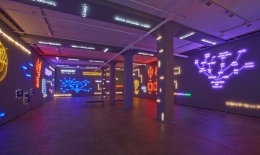 Installed in a response to the gallery’s specific architectural space, ‘Agnosia, an Illuminated Ontology’ will employ areas never before activated for exhibition purposes, creating an all-encompassing and profound experience for the viewer. 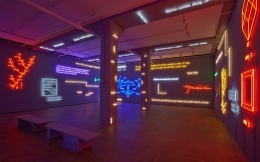 A radical pioneer of conceptual and installation art, Kosuth initiated appropriation strategies, language-based works and the use of neon as a medium – considering it a form of ‘public writing’ without fine art associations – in the 1960s. 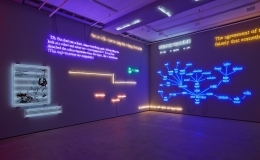 Kosuth’s ongoing investigations into language and perception, and the appropriated use of literature, philosophy and psychology have characteristically taken the form of works in series, a format that opens up space for play and reflexivity in multiple directions. 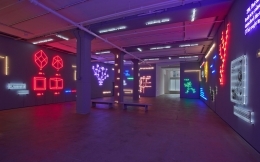 Key examples from the artist’s most iconic neon series will be on view, including elements from Kosuth’s renowned ‘Freud’ series (1981-1989), in which the artist puts the psychoanalyst’s texts regarding unconscious function-ing meaningfully into play using wall pieces and installations, and from his acclaimed ‘Wittgenstein’ series (1989-1993), which illustrate the fervent influence of the philosopher on Kosuth’s foundation of thinking, and belief that art should ask questions about itself, as a language engaged in the production of meaning. 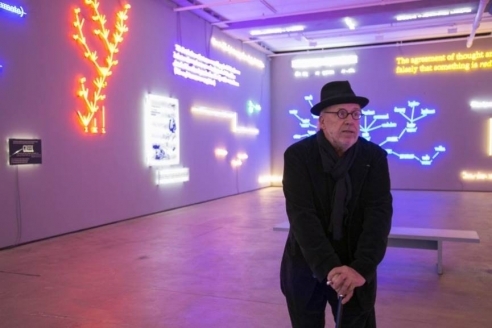 Joseph Kosuth lives and works in New York and London. He has participated in numerous Documentas and Venice Biennales; his work is collected by major museums throughout the World. 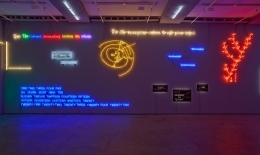 In 2001 Kosuth received the Laurea Honoris Causa doctorate in Philosophy and Letters from the University of Bologna and in 2003 the Austrian Republic’s highest honor for accomplishments in science and culture, the Decoration of Honor in Gold. In 2012 Kosuth was inducted into the Académie Royale des Sciences, des Lettres et des Beaux-Arts de Belgique. 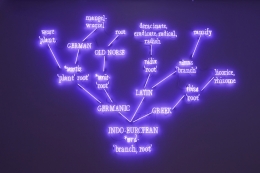 Kosuth’s exhibition entitled ‘ni apparence ni illu-sion’, an installation work throughout the twelfth-century walls of the original Louvre Palace, opened at the Musée du Louvre, Paris in 2009, and became a permanent work in 2014. His work on the façade of the Council of State of the Netherlands was unveiled in October 2011 and he is currently preparing a permanent work for the four towers of the façade of the Bibliotheque Nationale in Paris. Kosuth has recently been commissioned to create a major site-specific installation for a new cultural center being built to revitalize the former mining town of Kongsberg, Norway and for a new laboratory building being constructed on Novartis' extended Cambridge, Massachusetts campus, designed by architect Toshiko Mori. Recent solo exhibitions include; ‘(Waiting for ¬–)’ Texts for Nothing Samuel Beckett, in play, at the Australian Centre for Contemporary Art, Melbourne (2010) and – in an extended version – at the Haus Konstruktiv in Zurich (2011); ‘Sigmund Freud and The Play on the Burden of Representation’, 21er Haus, Belvedere Museum, in cooperation with the Sigmund Freud Museum, Vienna, acknowledging the 75th anniversary of the death of Freud; and ‘Amneziya’, his first solo exhibition in Russia, at the Multimedia Art Museum, Moscow. 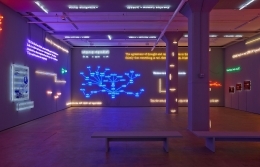 Most recently, the Philadelphia Museum of Art invited Kosuth to curate a special installation of his work alongside a selection of works by Marcel Duchamp from their permanent collection. The installation will be on view in their contemporary galleries beginning this fall for a year. Concurrent with this installation, Sean Kelly will present Robert Mapplethorpe: Unique, an exhibition of Polaroid photographs by Robert Mapplethorpe, in the front gallery space. 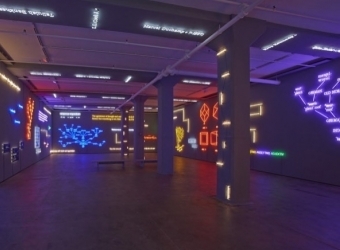 "Neon Retrospective Asks "Have You Been Reading the Writing on the Wall?"